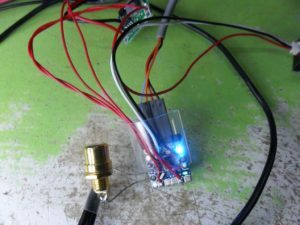 Wanting an OSD to display the basics and GPS information in a small FPV plane but not wanting to waste a lot of time playing flight controllers, I decided to try the MinimOSD Micro running with just a GPS module and a small current sensor. I don’t run Windows so it had to be set up using Linux – Arduino works well and there is a Linux version of the MWOSD Configurator, although I haven’t tried it yet. The CP2102 USB breakout module just works – no driver issues – appeared as ttyUSB0. So I wired it together to run on the bench but be easily transferred into a small plane. The MinimOSD Micro module, a small NZ-GPS module and a small current sensor module all came from Ebay. 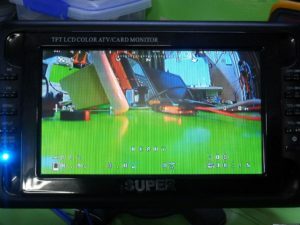 For bench testing the OSD video output went directly to an old low-res FPV monitor – because it was already on the bench. I used the Arduino program “serial monitor” to check the NZ-GPS module. It’s providing data at 9600-baud by default – the blue LED in the GPS module flashes when it see satellites. Inside on the workbench it only sees 3-4 satellites (not enough for a fix), and occasionally 5. The Arduino program can load the MW-OSD code which can be configured, compiled and loaded into the OSD. Compiling did produce some warnings but I ignored them and it didn’t seem to matter. There are lots of other parameters that can be configured before uploading to the OSD, but it’s probably easier to use the configurator program, although it connects to the same port as the GPS. The small current sensor was sired to provide current and battery voltage to the OSD. I changed the shunt resistor to lower the maximum current from 60A to about 15A – still to be calibrated.